Camellia japonica 'Margaret Davis' (Camellia japonica 'Margaret Davis'): growing, planting, caring. A cultivar of Japanese camellia, with double white flowers. 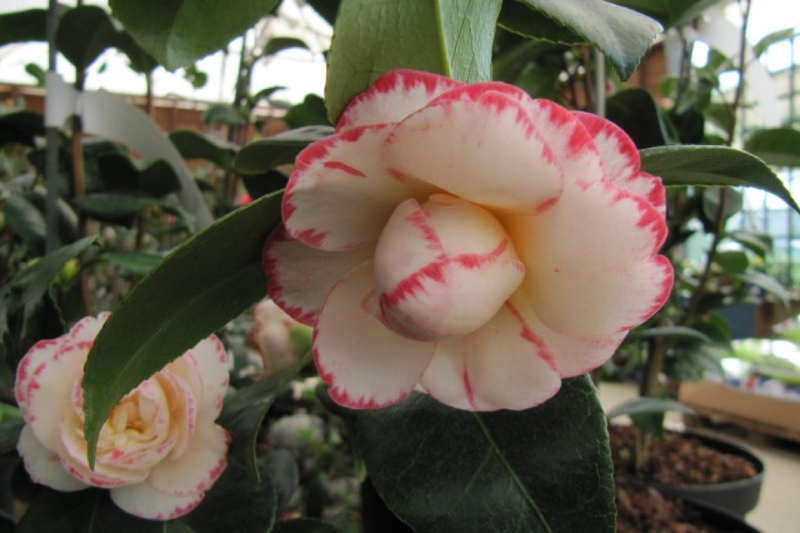 Full description for Camellia japonica 'Margaret Davis' not yet available. Camellias are evergreen shrubs or small trees, with alternate, simple leaves, lanceolate to elliptical, slightly toothed, lustrous. The flowers are of several types, some single with 5-8 petals, semi-double, some classic double, irregular double, some with anemone flower, or some with peony flower. Beware, the camellia is demanding, and will require a lot of attention - in return, it is a superb shrub for who knows how to take care of it! Plant your camellia away from the strong sun, and from cold winds. The camellia is a plant of acid soil, but it will wither in a pure heathsoil, that is too poor for him. It is therefore necessary to think of enriching the soil with potting soil, or somewell decomposed compost. If you want to plant a camellia in open soil, in neutral soil or limestone soil, you must create a wide pocket of garden felt corresponding to 2/3 of the volume of the foliage of the adult plant - otherwise it will be limited in size. At the bottom of this pocket, deposit a layer of clay balls, then add a mixture of equal parts of heather, soil and garden soil. Basin the rootball before planting, plant without burying the base of the trunk, form a hollow and water copiously. In pots, choose dwarf species, and provide each plant with a pot of at least 40 cm in diameter, with clay balls at the bottom, and a mix of loam, potting soil and heather. Soak the pot for 20 minutes. Mulch your camellias in November and April with bark and pine spines, and before winter, add a thick layer of leaves that will protect the superficial roots from the frost. Water generously and often in spring and in summer for the first year, a little less the second, and then mostly during high heat periods and that is all: outside of particular conditions, your ground-planted camelia will manage very well on its own (rainwater is gentle which is perfect!) If your camelia is potted, you must think about it from time to time. Rather than watering the pot for long minutes, completely immerge it in a basin while you water the rest of your plants! One thing: you can provide small basins at the base of the shrubs and then spread out a 10 cm thick layer of mulch. In the spring, water in the morning, and in the summer, in the evening after the sun has set. A small problem when watering: if your tap water is too hard, your plant won't appreciate it as much! A simple solution is to collect rainwater, but that isn't only an available option for everyone... If in doubt, add fertilizer for heather from time to time to help solve the problem. Your camelia will hold better if you watch over it — and provide supplies — just before winter and during spring. In winter, provide a green fertilizer on the top of the soil every year. In spring, you can provide heather compost if you notice a yellowing of the leaves' veins. You can also provide simple supplies of lye from time to time by spreading wood ash. Another simple and natural possibility: dried banana! Cut the banana peel into small pieces and bury them at the base of the plants: it will provide phosphorus and potassium. In heavy and claylike soil, the supply of organic material doesn't acidify the soil. You must use a limited and regular blending of sulfur, following the directions exactly so as not to kill the soil life. Your potted camellias will appreciate an input of new soil in automn: renew the first 5 cm of substrate with potting soil and heather earth. Prune the camellia lightly, after flowering, although adult subjects can withstand severe trimming. Cut the stems that "unbalance the plant", the dead branches, and the branches that intersect.